On March 13 and 14, 1855, the firm of J. A. 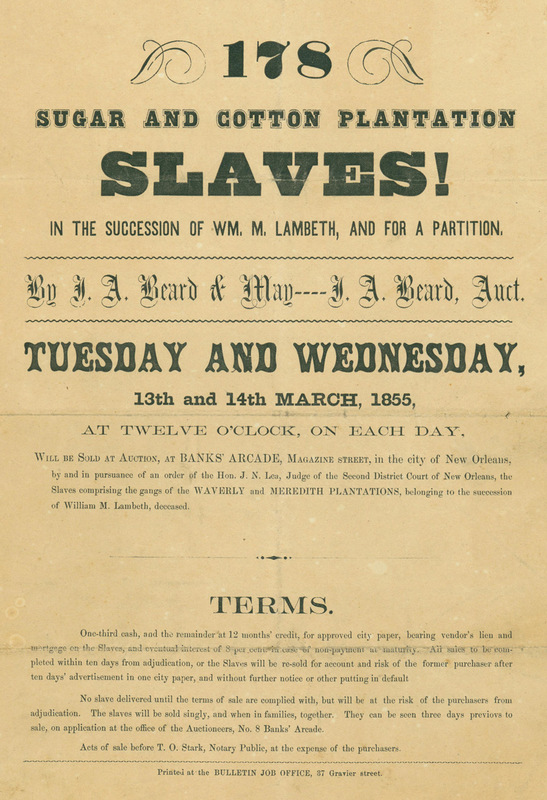 Beard & May placed on the auction block 178 enslaved men, women, and children at the Banks Arcade in New Orleans, Louisiana. They were part of the estate of William M. Lambeth, who had died in 1853. 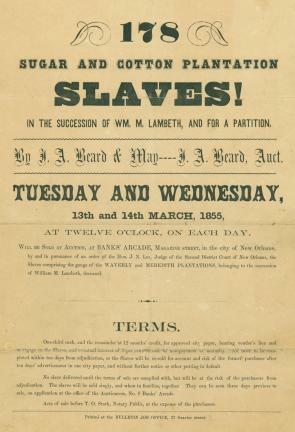 To settle the estate, Judge J. N. Lea had ordered the sale of 127 slaves from the Waverly plantation and 51 from the Meredith plantation, both in Avoyelles Parish. 18. Anthony Moore, about 30 years, fine engineer and field hand. 19. Sarah Moore, 32 years, good field hand; tonsils occasionally inflamed. 24. Sophy, 12 years, likely. By J. A. Beard & May----J. A. Beard, Auct. Will be Sold at Auction, at BANKS’ ARCADE, Magazine street, in the city of New Orleans, by and in pursuance of an order of the Hon. J. N. Lea, Judge of the Second District Court of New Orleans, the Slaves comprising the gangs of the WAVERLY and MEREDITH PLANTATIONS, belonging to the succession of William M. Lambeth, deceased. One-third cash, and the remainder at 12 months’ credit, for approved city paper, bearing vendor’s lien and mortgage on the Slaves, and eventual interest of 8 per cent. in case of non-payment at maturity. All sales to be completed within ten days from adjudication, or the Slaves will be re-sold for account and risk of the former purchaser after ten days’ advertisement in one city paper, and without further notice or other putting in default. No slave delivered until the terms of sale are complied with, but will be at the risk of the purchasers from adjudication. The slaves will be sold singly, and when in families, together. They can be seen three days previous to sale, on application at the office of the Auctioneers, No. 8 Banks’ Arcade. Acts of sale before T. O. Stark, Notary Public, at the expense of the purchasers. A pdf of the complete document is available here.